The last time I’ve dined at Má Pêche, prior to this visit, was when Executive Chef Tien Ho helmed the kitchen (when the menu initially had Vietnamese touches) and now it’s by Chef Paul Carmichael hailing from Barbados, where it reads less so but that doesn’t mean it’s a bad thing. Not at all. 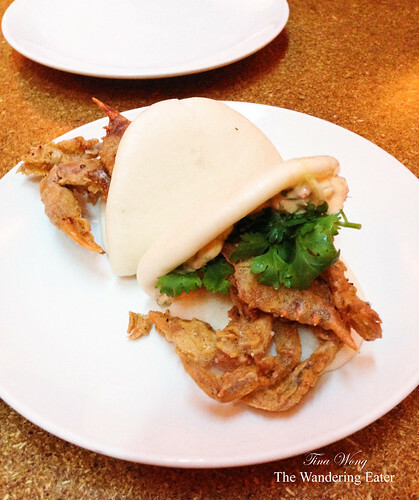 Some seasonal items were phenomenal, namely the duo of soft shelled crab buns that’s ethereally crisp from the fryer stuffed in the puffy steamed baos, lightly slathered in spicy Calabrian chili mayonnaise and ginger scallion sauce with a touch of cilantro to give it a fresh zip. 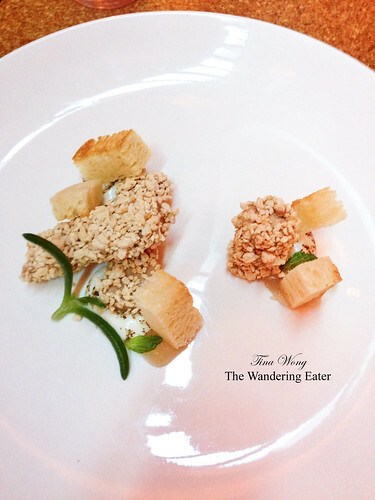 The foie gras was arguably the weakest of the four dishes we had. While the rectangular logs of silky, fatty duck liver was delicious, we kept tasting a lot of nutty flavors from the crushed almonds that encrusted it and masking the delicate liver-y flavors of this delicacy. We didn’t taste the sarsaparilla or malt that’s supposedly in this torchon and the oddly shaped, small slices of brioche were fine though we wouldn’t have mind for a little more brioche. Fried sweet breads with almond, egg yolk, and anchovy were phenomenal and gorgeously plated. 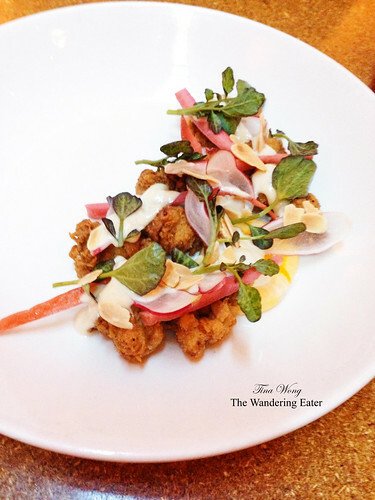 Crisp offal that almost pass for chicken nuggets were great with the crunchy almond slivers, creamy yogurt sauce, pickled daikon, and poached egg yolk. We’re swooned and if it’s still on the menu, order it. Their braised cavolo nero, a type of kale, was a substantial vegetable dish that packed with a lot of potent flavors that satiated us pretty quickly. 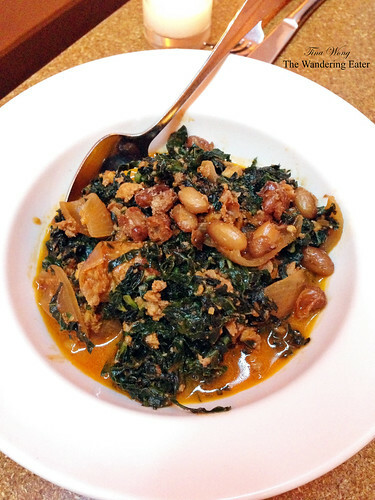 The cavolo nero was perfectly braised and soft that it pervaded a subtle sweetness and the spicy chorizo nubs was the dominant, persistent flavor that lingered on the palate beside the subtle bitterness of beer and the creamy cranberry beans mixed throughout the dish.